Because our physical spaces always reflect what is going on internally, you can design your home to attract new opportunities into your life. The best place to focus on in your home is your front door. Think about. Your front door is how you arrive home. It is the portal through which you bring in the new and send out the old. It is the place where friends and strangers knock; asking for permission to enter your life. This is why I recommend paying attention to your front door if you are looking to attract new opportunities into your life. Think about what kind of message your front door is currently saying about your life. You can also consider any side doors from which you might enter your home on a regular basis. Is the entry way clean? Is the path clear from clutter, dead plants, out of season door wreaths, etc.? Is there good lighting by your door? Is the door damaged and does it open and close easily? Is your front door easy to find? Are there house numbers nearby? Whatever the state of your front door may be, I bet you can find a parallel to your own life. If your door is hard to find or open, perhaps you are having difficulty finding new opportunities or getting people to pay attention to you. If the path to your front door is cluttered or filled with old, neglected items, do you feel unclear about what you want to attract into your life? Parallels between the state of your home and the state of your life are often strikingly strong. This is because whatever level of consciousness we are operating at will be fulfilled in both our physical space and the state of our life. So, let’s take a look at what we can do to update our level of consciousness. Here are some of the best things you can do to your home to start attracting new opportunities into your life. Cleaning is always the best place to start. Wash your door, sweep your walk way, and mop or vacuum the floor in your entry way. Cleaning shows the world that you are serious about being taken seriously. 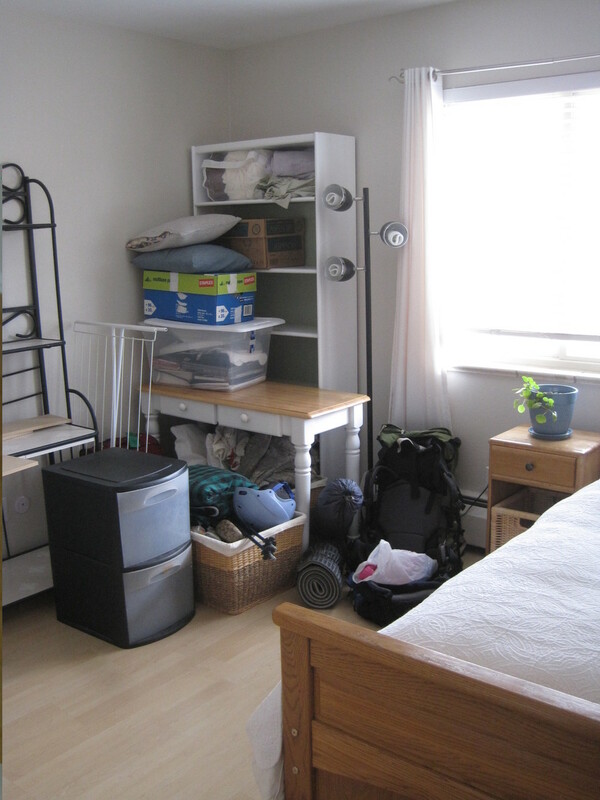 If you have any clutter or neglected items by your front door or in your entry way, it’s time to toss the mess. Clutter keeps energy stagnant and keeps you holding onto the past. If you want new opportunities to enter your life then you need to make the space for them to enter. If it is at all within your control, make sure the lighting by your front door is in working order and that your home is easy to find. Making sure your home is clear and visible is also how you can improve the chance for new opportunities to find you. Finally, consider and then implement a few things you can do to make your front door appear more welcoming. Perhaps you can add a fern or a pot of flowers by your front door. Maybe you could paint the door, hang a wind chime, or add a small bench to the area. Whatever you can do to make this space appear more welcoming will help new opportunities be attracted to you. The reason why these improvements work is because while you are improving your home, you are improving your mindset too. You are improving your mindset in several ways. First, you are taking yourself more seriously and being more self-loving. We are much less likely to be mere spectators in our lives when we are taking loving actions of self-care on a regular basis. Second, you are building awareness around whether or not your actions are helping or hurting you. As you improve the visibility of your home, you are also encouraging yourself to think honestly about what you are or are not doing to make yourself noticed in the world. Third, you are helping yourself gain clarity on what exactly it is that you want to attract into your life. Sometimes sheer inertia keeps us confused about what we actually want. By shaking up your routine, you are reenergizing yourself and allowing new clarity to come into your life. And fourth, you are giving yourself the needed energy to reignite your sense of motivation. By taking action to improve your front door, you are much more likely to start taking other positive steps in your life. Like begets like. Once you start moving, it will be much easier to keep the momentum going. Today I came across a fun, on-line post about decorating with color and the effect it can have on our psyche. Loving anything about decorating, Feng Shui, or personal awareness, I clicked on it in mild amusement. As I have read many times before, the post talked about what colors to use in certain rooms and why. However, this time, I came across recommendations that I haven’t read before. The post recommended green in the bedroom, rather than the typical red, and to use yellow in the living room rather than the home office. I’ve read before that red can increase feelings of romance, thus possibly making it a good bedroom color, and that yellow is mentally stimulating thus making it a good office color. But here’s the thing, you’ve probably also read something different than the article I read today or the advice from other sources I have read in the past. It is true that color can affect our mood and that keeping color in mind can be a good idea when updating your home or moving into a new office. But, this advice is never one size fits all. For instance, blue is a calming color for most and is generally not recommended to use in a work environment. This is because it is thought that a more stimulating color is better for alertness, mental concentration, and creativity. But, perhaps you have a high stress job or work in a soul sucking, contentious atmosphere. Perhaps then blue is exactly what you need to make it through the day. Or perhaps, for you, blue is actually an invigorating color. Maybe it makes you feel rejuvenated like a day spent by the ocean does. No one really knows but you. And that is the single most important factor when it comes to decorating with color: know yourself! It may be tempting, especially if you are not into decorating or consider yourself a person who does not have a strong sense of style, to follow someone else’s advice. But strictly following someone else’s advice will lead you to living a life that is not in sync with you. You won’t end up with your desired feeling at the end of the day because you haven’t listened to and acted upon your personal preferences. It can be overwhelming to figure out where to start but remember, it isn’t necessary to aim for perfection right out of the gate. You just need to start with one or two things that you know to be true for you. To figure that out, I encourage you to take a moment to be still. Get comfortable, close your eyes, and take a few deep breaths. Now, let your mind wander to a place that feels really good to you. Maybe it’s a place that makes you feel alive and inspired. Maybe it’s a place that makes you feel expansive and tranquil. Maybe it’s a place that feels soothing and grounded. Let your mind take you to a place that feels good to you in this moment. When you get there, try to notice as many details as you can. Are there other people there? Are you in a man-made space or a place in nature? What are the colors and textures around you? What is the temperature like? Is it noisy or quite? If there is sound, from where is it coming? Soak up all of these details and notice how your body feels. Notice how your mind feels. What kinds of emotions are you experiencing? Would you like to feel this way more often? When you open your eyes, take a moment to write down the details you saw and felt. Our imaginations have a brilliant way of telling us what we long for. In your visualization did your imagination show you that you long to feel more energized? More grounded? Calmer? More attractive or put together? What did you experience and what types of colors and textures did your imagination show you that for you represents those feelings? This is the first step to understanding how your environment can affect the way you feel and how visuals in your environment represent those feelings. From this centered place of knowing, now you have the beginning of your road map to decorating your environment in a way that feels nourishing to you. As you read articles about color, see whether or not the information resonates with you. If it does, that’s nice. If it doesn’t, allow yourself to set that information aside. As you look at inspirational design pictures on-line, see if there are certain pictures that match your desired feelings. You may come across many beautiful photos but only a few that make you feel the way you felt during your visualization. That match in feeling can serve as a guide for how to update your space. When updating your space, your confidence or budget may have you start with only adding a small potted plant to sit by your window or a colorful scarf to throw over the back of your office chair. Small starts are perfectly fine because what you are doing is adding visual elements to your surroundings that are a match for how you want to feel. You are claiming a space, however subtle, and positively affecting your psyche. Overlaying the Bauga Map with the layout of your home is a very interesting exercise and one that I encourage you to do. Even if you don’t end up making any adjustments to your living space, the awareness you may get out of this could be astounding. For instance, maybe you end up realizing that your wealth and prosperity space is in your garage, where you have piled up so much forgotten junk over the years that you don’t even bother to go in there anymore. Are your finances in disarray and frightening for you to look at? I’m pretty sure you will end up finding a correlation or two between your life and the state of your home. Because our outer world tends to reflect our inner world, it’s fascinating to see all of the correlations when you take a moment to really look at things. Mindfulness is powerful! So, as I said in my last post, the Bagua Map can be mapped to any space; your home, your bedroom, your office, or even your desk. To map your space, first draw out the dimensions of your space and then overlay the Bagua Map with your space ensuring that the lower quadrants of the map line up with your front door, the entrance to your office, the front of your desk (the side at which you sit), etc. If your home has more than one story, simply overlay the Bagua Map in the same direction to your upper or lower floors as you have done for your primary floor (the floor in which your front door resides). While the Bagua Map is square, your space may not be and that is okay. For example, my home is rectangular and some of the Bagua map lies outside of my home. In Feng Shui, it is recommended to define and enhance that missing area in some way. If you own the missing space outside of your home (say the missing space lies in your front yard) you can define the space by adding a lamp post, water feature, plant, sculpture, fence, or anything that for you helps to symbolically define the space. Some people have even chosen to bury a natural quartz crystal (pointed part facing up) an inch or two below the ground with the intention of energizing and lifting the energy up in that quadrant of their Bagua Map. As for me, I live on the second floor of a condo. While I’m not sure what I can do with the space outside my window that is a part of my Bagua Map, I’m choosing to believe that whatever intention I set about enhancing this “missing” area will suffice to energetically enhance that space. For example, I’m thinking I might put a crystal on my windowsill and have that symbolically represent the inclusion of this “missing” space. As an example, below is a map of my home and overlaid on it is the Bagua Map. Here is where the interesting part begins. Part of my wealth and prosperity area exists on my deck. Currently, my deck is neglected, not messy but neglected. I have a lot of empty pots, some dirt, and gardening tools waiting to be used on my deck. They are all neatly organized on a piece of outdoor furniture but they are not in use. There is potential but currently no growth. In Colorado (where I live) people advise to not start planting until after Mother’s Day since the snow is so unpredictable around here. Thank goodness this Sunday is Mother’s Day as I think it is time to start enhancing this area of my life. Since mapping my home though, I have switched my bedroom into the guest bedroom and have moved my office and guest room into the master bedroom. When my bed was in the master bedroom, so was my desk, computer, printer, work files, etc. This room is also close to the condo’s front door where the inhabitants of three other units are also constantly coming and going. No wonder I woke up each morning never feeling quite rested. This space, the helpful people and travel area, is meant for movement, new ideas and new opportunities. Since I have moved my bedroom into the smaller room, which is tucked into a quieter part of the house, I have begun to sleep much more soundly. And because the room is small, it only contains my bed, a closet, and a dresser, which is all that is really needed anyhow. So, are you ready to start mapping your home? If you do, I bet you will find it to be a fun and insightful process. You do not have to tackle making changes to all areas of your home but perhaps there are one or two areas you will feel inclined to modify once you have seen how the state of your life is a direct correlation to the state of your home. If you have any questions on how to do this or would like some help on coming up with ideas on how to modify the energy in certain areas of your home, feel free to comment below. Perhaps the most fundamental tool in Feng Shui is the Bagua Map (pronounced baug-waah). The Bagua Map is used by correlating it to the structure of your home and then making adjustments in your home to align with energetic patters of vitality, happiness, and good fortune. This map was developed several thousand years ago in Ancient China. Today, millions of structures and designs have been influenced by it. Even if you don’t believe in the contents of the map, setting and acting upon your intentions is likely to bring about a positive change in your life. For me, this is reason enough to make some adjustments in my home because I believe greatly in the power of intention. 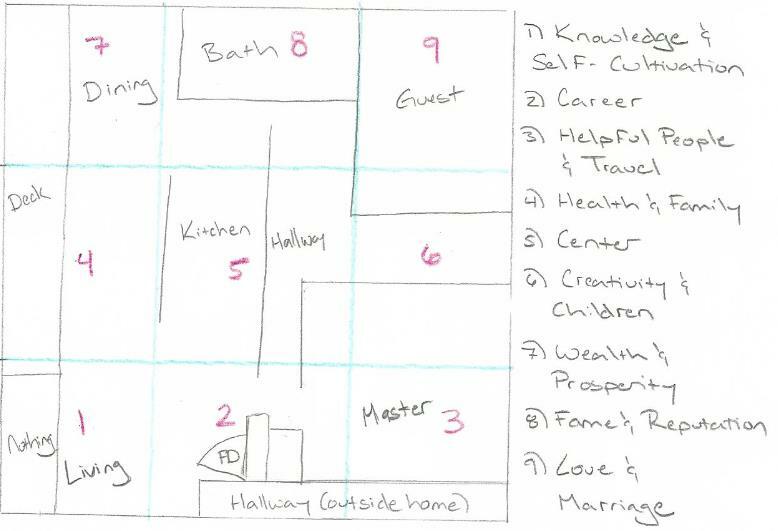 To use the map, align the front entrance of your home with the lower quadrant of the map (the lower quadrants consists of Knowledge and Self-Cultivation, Career, and Helpful People and Travel). The front entrance should be the door that was designed to be the official entrance to your home. For instance, if you have a door at the front of your home but always enter your house through the door in the garage, you would still want to align the lower quadrant with the door that is at the front of your home. Naturally, not everyone has a perfectly square home and sometimes, depending on the shape of your home, certain areas within the Bagua Map will overlap with your yard or the street; areas that are not necessarily inside your home. This is fine but do note that this space could also use your attention to correct for any energetic imbalances. Also, if your home has more than one story, you simply want to translate the map of the first floor directly above or below your home’s main story. Note that the entire Bagua Map can be applied to any space such as your bedroom, office, or even your dining table or desk top. You do not have to have access to an entire home in order to make these energetic adjustments to your life. With the right attitude, wherever you choose to put your intention, you can surely reap positive results. Below is the map and in my next post, I will show you how to map it to your space. Yay, for energetic adjustments!